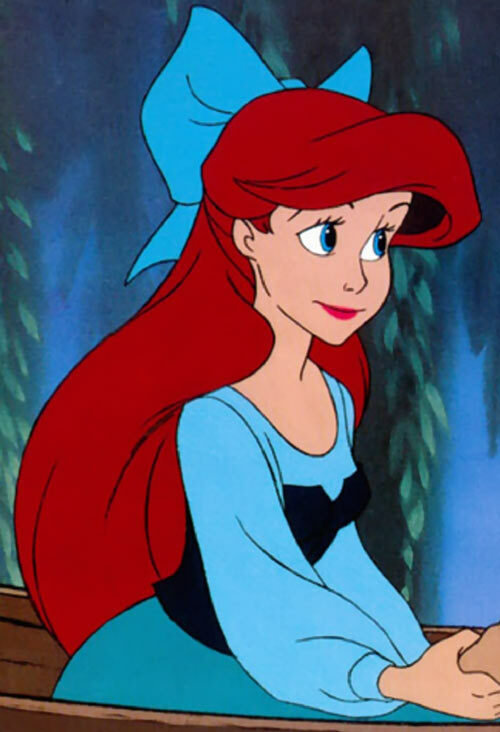 This is Ariel from Disney’s 1989 animated feature The Little Mermaid. The movie was of course inspired by Hans Cristian Andersen’s 1837 fairy tale . 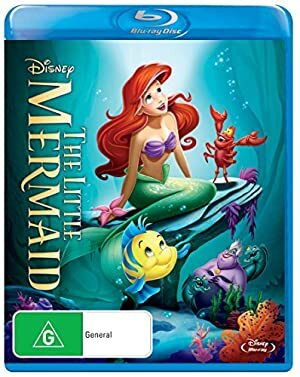 It spawned a direct-to-video sequel in 2000 The Little Mermaid II: Return to the sea, then in 2008 a prequel The Little Mermaid III: Ariel’s Beginning and an animated The Little Mermaid TV series that ran from 1992 – 1994. This film marked the start of the Disney Renaissance and was the first true Disney musical in years. This writeup will only cover the first film and includes S P O I L E R S.
Known Relatives: King Triton (Father), Ursula (Aunt), Auata (Sister), Andrina (Sister), Arista (Sister), Attina (Sister), Adella (Sister), Aana (Sister), Prince Eric (Husband). Base of Operations: Eric’s Kingdom formerly Triton’s Kingdom. Height: 5’4″ Weight: 105 lbs. 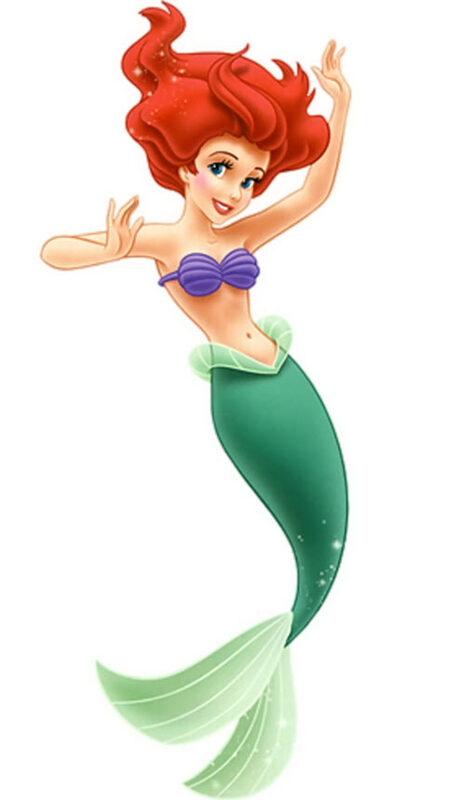 Ariel is a young mermaid, which means she can breath both air or water, and swim superhumanly fast with her fish tail. Physically, she is very similar to your average 16 year old. As a princess, she’s professionally trained in music and performance. She is endowed with a beautiful singing voice. However, she has little interest in practising and would rather be off seeking adventure. Because of her adventurous spirit, Ariel has made a diverse group of allies. A special few know a bit of magic. One example is Ursula the villainous witch. Just as man has dominion over all animal life, the merfolk have dominion over sea life. They use all manners of sea life as beasts of burden, as instruments, etc.. The fish don’t seem to mind and react happily. The merfolk don’t eat fish… their diet is unrevealed. Besides humans, merfolk don’t appear to have any natural predators. For example, sharks will ravenously chase Ariel’s friend flounder but not Ariel herself. As per a decree of the xenophobic Triton, merfolk have no contact with humans. A great celebration was taking place in the mer-kingdom. 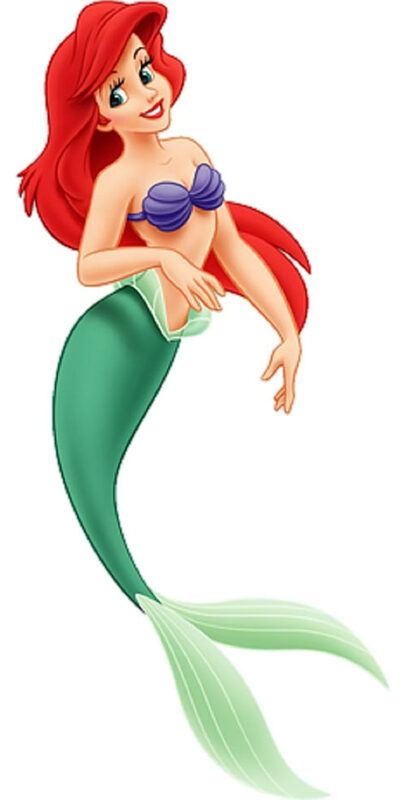 Triton’s youngest daughter, Ariel would make her singing debut. The entire kingdom was hectic! Only, she forgot and went treasure hunting instead, embarrassing herself, her father, her music instructor Sebastian, and her sisters. Ugh. Triton orders Sebastian to chaperone Ariel. He also commands Ariel never to visit the surface world again. Of course, she disobeyed him at her first opportunity. This time she and Flounder, her BFF (best fish friend), went to her hidden treasure trove full of human relics. But Sebastian followed. In the middle of a stern rebuke by Sebastian a ship passed overhead. Ariel swam up to investigate. She saw fireworks, people dancing and playing music, and she caught her first look at the handsome Prince Eric. Ariel fell for the dashing Prince at first sight. Ariel learned that the Prince was unattached. In fact, he had been daydreaming about how he’d meet his one true love. Bam! Just like lightning. As if in response, a hurricane blew in, throwing lightning down on the ship. Despite all efforts, the ship was soon lost. Everyone took to the life rafts. Prince Eric made heroic efforts to save others, even returning to the immolated ship to save his dog. Thus, when the gun powder caught, he was still onboard! The men could only look on helplessly. Ariel, on the other hand, was able to pull the Prince to safety. She dreamed of staying with him and was singing aloud when he awoke. She splashed away just as he came to. So, he was sure that he had seen her, heard her, but had no idea whom she was. Sebastian wanted to keep Ariel’s surface foray a secret. But she couldn’t contain her love for the Prince. Her sisters picked up on it and told their father, who believed she was in love with some lucky mer-man. In a comical Three’s company-style mix-up, Sebastian ended up telling the King himself. In the aftermath, King Triton confronted Ariel and angrily destroyed all of her human treasures. He left Ariel crying among her broken things, feeling he may have gone too far. At this low point, Flotsam and Jetsam, a couple of moray eels working for the witch Ursula, made their move. They convinced Ariel that Ursula could help her be in the Prince’s world. She left with them straight away to Ursula’s lair. 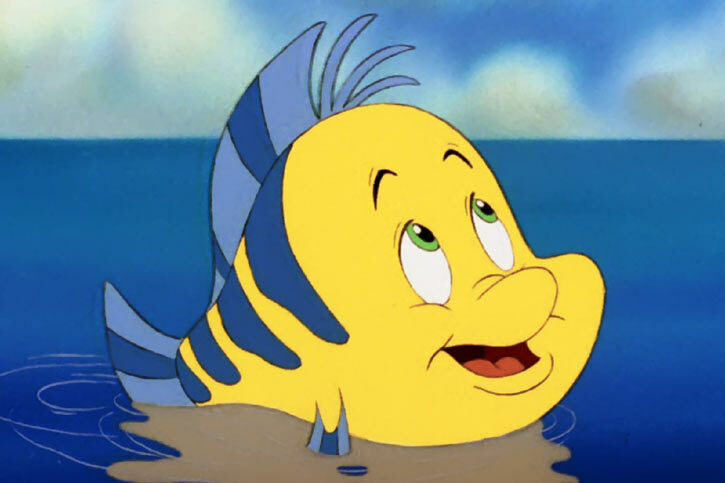 However, Sebastian and Flounder followed. Ursula offered to turn Ariel into a human for three days. If, before the end of the third day, the Prince kissed Ariel with a kiss of true love, she would permanently become human. But if Ariel failed, she would be a mermaid again and a slave to Ursula. Furthermore, the price of the spell was Ariel’s voice. Nothing is for free. Ariel saw no other option. To give up now would be a life of misery. Thus, she reluctantly signed the contract. Ursula wasted no time in completing the spell, taking Ariel’s voice and transforming her into a human. If it weren’t for Flounder and Sebastian, Ariel may have drowned right there at such a depth. Thus, Ariel did meet the Prince. He was stunned, and thought that she had to be “the one”. However, as she couldn’t speak, he sadly came to the conclusion that she wasn’t, and he had to keep looking for his true love. Still, Eric felt sorry for her. He took the mute Ariel to the palace to get her new clothes. Ariel was amazed at the sights. She tried hard to fit in, but only ended up making several comical mistakes, like combing her hair with a “dinglehopper” (actually a fork). All the while, Eric went on about finding this elusive “one”. Yet it was obvious that he was totally taken with Ariel. Eric and Ariel spent the second day together. They were about to kiss when Flotsam and Jetsam tipped the literal love boat, spilling them into the water and ruining the moment. This was because Ursula had become greatly concerned over losing Ariel. The Prince was obviously falling in love. Thus, Ursula then took matters into her own hands. She magically turned herself into a young human woman, endowed with Ariel’s lost voice. Ursula entranced Eric with her illusory beauty, Ariel’s voice, but most of all a hypnotic spell. As “Vanessa”, Ursula would marry Eric at sundown. Ariel’s friend Scuttle learned the truth about Ursula. He hastily informed the others. They flew into action, and disrupted the ceremony. In the melee, Ursula’s seashell necklace was broken, releasing Ariel’s voice. Just as Ariel was about to kiss Eric, the last rays of the sun disappeared. Ariel sank to the deck a mermaid again. She had failed. Ursula, triumphant, grabbed her prize, King Triton’s daughter. She dragged her back down to her lair below. Sebastian arrived at Usula’s lair with Triton at his side. However, the contract was real and binding. Even the King had no power to break it. The King gave up and did the only thing a father could. He traded himself for his daughter, releasing her and condemning himself to Ursula’s garden. Ursula grabbed up Triton’s crown and magic trident. She used these to grow to colossal size. In a turn of fate it was Prince Eric who would kill the sea witch, undoing all of her spells. This included freeing all of the victims from her garden. Triton would finally see that all humans aren’t so bad. He also was sympathetic to Ariel and released her to be with Eric, turning her human once again. The two were happily married. 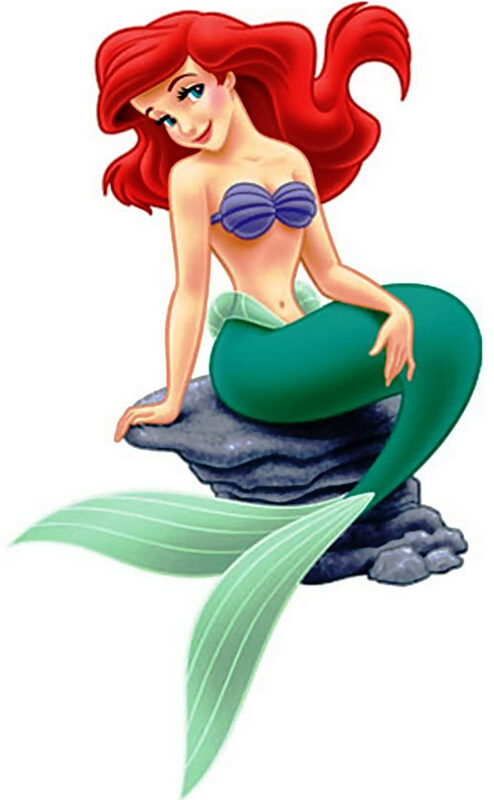 Ariel is a beautiful young mermaid with long bright red hair and striking blue eyes. Her tail is a light green. Ariel has a slender build and fair skin. Her only clothing is a couple of blue/purple seashells. When treasure hunting she carries a shoulder bag. 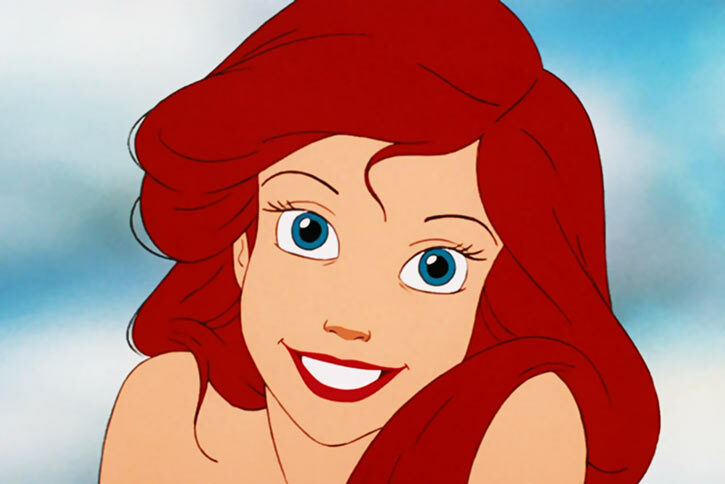 Ariel is a headstrong, free-spirited, teenage girl. Rebellious towards her father’s authority, learning about the world and trying to find where she fits in it. She has lofty dreams of getting out and exploring the world. A strong desire compels Ariel to discover that other world above the ocean waves. Some have said that Ariel leaves the ocean for Prince Eric but I don’t think so. She leaves it for a chance to be part of this other world. She had a grotto full of human artifacts before she ever met Eric. Once in the human world on human legs, she was overjoyed by every aspect of it. Ariel would be a daughter to the King of Poseidon/Tritonis (Atlantean Mermaid City) in place of Triton. As a super-teen keep her as a mermaid, or have a way for her to switch at will. Sebastian (High), Flounder (High), Scuttle (High), King Triton (High). Age (young, 16), Distinct Appearance, MPR (No legs), Minor Irrational Attraction to Prince Eric, Minor Irrational attraction to curiosity, Misc. : Ariel knows very little about the surface world. 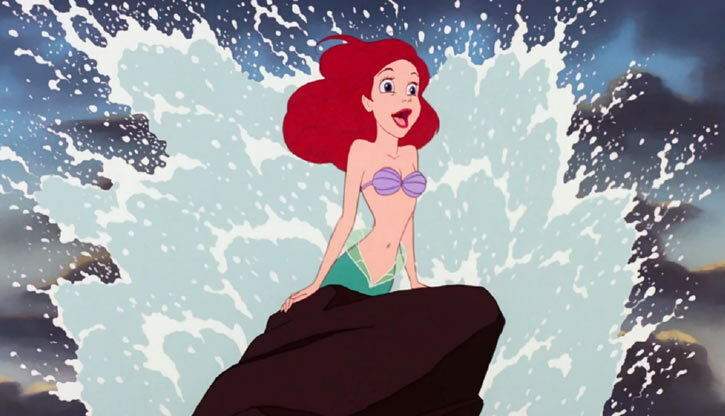 Ariel in human form has the same stats as she did as a mermaid, except that she loses all of her powers. Though she remains human at the conclusion of the film, I have left her powers because I expect people will use her as a mermaid. Wealth, well, money is never mentioned in any capacity. But Ariel is a Princess and she marries a Prince so, it will likely never be a problem for her. Thus, Ariel acquires the Financial Backer (Billionaire) Advantage… but the story is at that point concluded. At one point, Sebastian goes through a clothes-washer ringer. He comes out flat as a piece of paper, then puffs right back to normal. This is simply a quick shift to the Comedy genre. Ariel may get the Drawback: Authority Figure since she married Eric…however, maybe not. She may let Eric run the Kingdom while she runs around having more adventures. I guess I could watch The Little Mermaid II to clear that up. I didn’t add it now. Special Credentials is assumed but not demonstrated. Swimming down great depths has no effect on *anyone* in this film. Even Eric swam down to Ursula’s lair and back. Harmful pressures don’t seem to exist in the Disney-verse. Also, water temperature stays relatively comfortable throughout. And there’s enough natural light, no one needs ultra-vision. Height and Weight are guesses in the absence of official data, as usual. 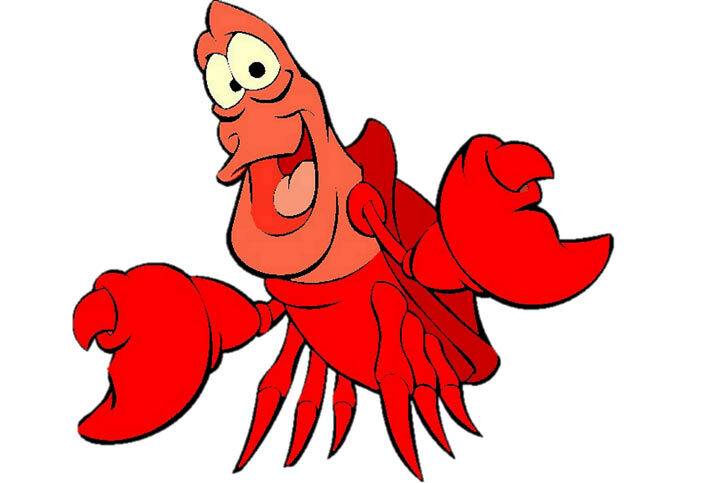 Sebastian the crab – not a sidekick but a good friend to Ariel. Shrinking is Always On and already factored into stats. Flounder the tropical fish and Ariel’s best friend. 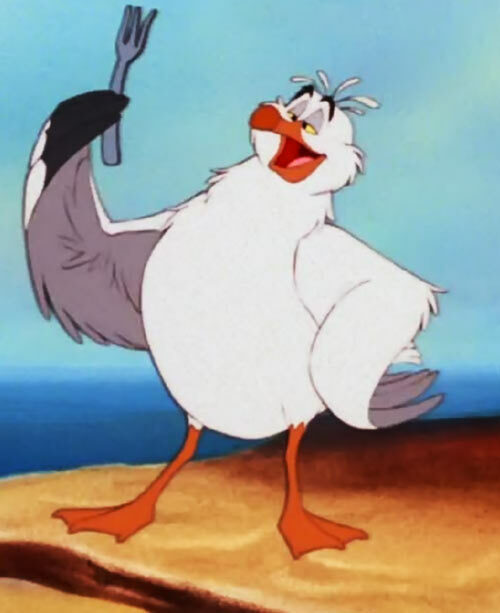 Scuttle the Seagull, an adventurous and strange bird. Shrinking is Always On and already figured into stats. Familiarity (some human…stuff, a failed roll and he’ll make something up). Minor Irrational Attraction toward acting oddly. Helper(s): IMDb, Rachel Wagner articles at Rotoscopers.com , Wikipedia, Brent Walters. Writeup completed on the 30th of September, 2017.